In ITER, the devices that need to be attached to the walls (or floors, or ceilings) can weigh several tonnes. 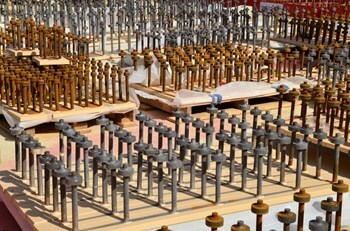 Embedded plates are the solution for extremely robust anchorage. Attaching a coat rack or shelf to a wall in your home is a relatively easy operation: drill a couple of holes, insert a dowel or wall plug, add the proper screws and the job is done. In ITER, of course, things are slightly more complex. For structural as well as for nuclear confinement reasons, drilling holes in the walls of the installation is not practicable. And the devices that need to be attached to the walls (or floors, or ceilings)—the equivalent of our shelves and coat racks—can weigh several tons. The solution comes in the form of an embedded plate. If you look at an embedded plate before it is embedded you might mistake it for a small coffee table equipped with supernumerary legs. Although embedded plates come in different sizes, they all consist of a thick steel plate onto which are welded equally thick steel studs with rounded heads. 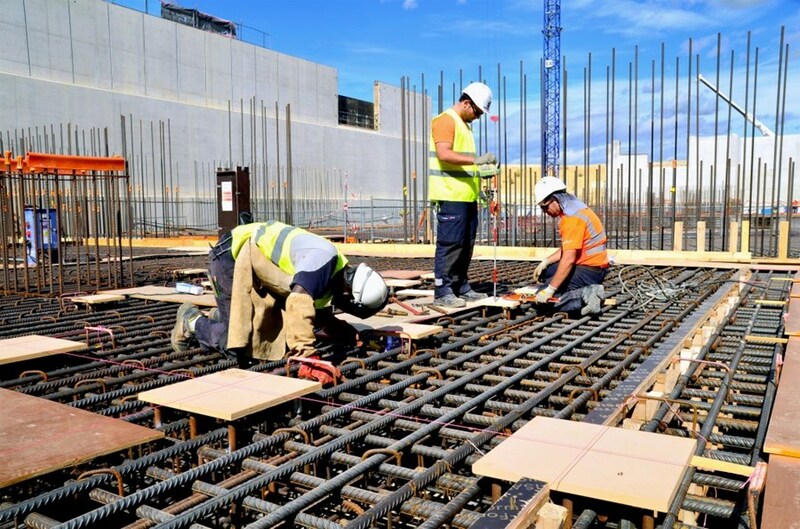 Embedded plates are inserted into the rebar lattice prior to pouring concrete. As the plate is positioned in accordance with the 3D Configuration Management Model and tuned with a precision instrument (theodolite) in order to be level with the future concrete surface, the studs (up to 16 for the largest plates) penetrate deep into the lattice. 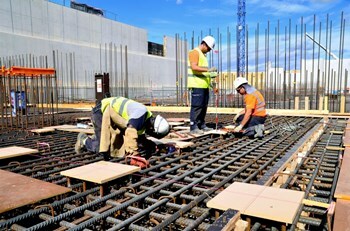 Embedded plates are inserted into the rebar lattice prior to pouring concrete. Each plate is positioned in accordance with the 3D Configuration Management Model and tuned with a theodolite in order to be level with the future concrete surface. Once the concrete is poured and has set, the studs and their rounded head provide extremely robust anchorage, capable of supporting loads of up to ~90 metric tons in pure traction. Equipment supports such as magnet feeders, cooling water system tanks, diagnostic systems, cryolines, cable trays, etc., can then be welded onto the plates. In the floors, walls and ceilings of the Tokamak Complex there will be roughly 60,000 such embedded plates—16,000 in the basemat slab alone. Another significant client: the cable trays running inside the Complex and throughout the galleries outside will require 20,000 plates. Although Configuration Management Models are very precise tools for positioning the plates, calculations and models must be confronted to reality. This is one of the roles played by the B2 slab mockup, a 150-square-metre structure that reproduces the complex rebar arrangements of the Tokamak Complex basemat slab. 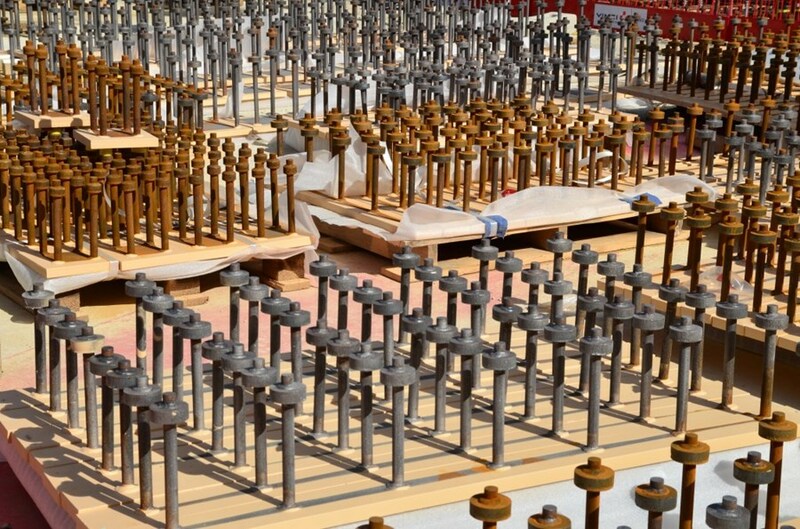 "As with the rebar and concrete, we need to have hands-on experience of the difficulties we might encounter in the installation of the embedded plates," explains ITER Nuclear Buildings Section Leader Laurent Patisson. The density of plates is such that there will almost certainly be some instances of conflict between the rebar lattice and the planned positioning of the plates. "The Configuration Management Model is now frozen for the B2 slab and will soon be frozen for the other levels," says Laurent. "If and when we encounter this type of conflict, the systems will have to adapt."